Installation of Vanderbilt’s bright blue Intelligent Access Management System throughout the East Whiteland Township Volunteer Fire Association’s 19,000 square foot facility, which consisted of 25 doors and about 150 cardholders. East Whiteland Township, Pennsylvania – a 10,650-person Chester County community located about 20 miles west of Philadelphia. Whiteland Township was founded in 1704, and today it is divided into east and west designations. The East Whiteland Volunteer Fire Department was established in 1953 to provide fire, rescue and emergency medical services (EMS) to the township and has since evolved to meet the changing needs of the community. But in order to meet those needs, the transitory volunteer workforce needed a more effective way to manage access and navigate throughout its 19,000 square foot facility – a facility that features 26 doors and 150 cardholders. In order to streamline access management in the facility, the East Whiteland Township Volunteer Fire Department turned to the expert locksmiths at Great Valley Lockshop. The key scan system that previously existed in the firehouse presented a lot of problems, notably panel and software freezing, doors operating incorrectly and outdated vendor support – all of which impacted the quality the firefighters were able to provide to the public. In an emergency situation, every second counts. When a building catches fire, a mere second can be the difference between life and death. Seconds can be the difference between being able to salvage a structure and having to completely demolish it. But when firefighters can’t get to the equipment that they need, into the trucks and out to the scene in a timely matter, these precious seconds tick away. In a facility with 26 doors and 150 cardholders, access management at the East Whiteland Volunteer Fire Department was becoming a challenge – especially considering the inefficient and outdated means of access management that existed at the time. 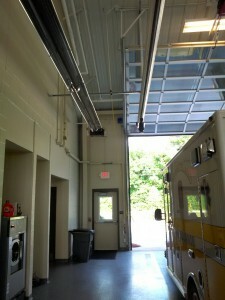 The firehouse needed an access management system to make up for the inefficiencies of its old key scan system. It also needed qualified professionals to ensure that the system was installed and programmed efficiently for use in the firehouse. That’s where the experts at Great Valley Lockshop came to the rescue with a practical, effective solution. Strauss and Great Valley Lockshop decided on the bright blue Intelligent Access Management System from Vanderbilt for the firehouse’s access management needs. Specifically, the system is capable of managing up to 32 doors and 5,000 cardholders. It features an embedded intelligent design, meaning that no one computer is required for software installation – rather, any computer with Internet access can manage and monitor the system. What’s more is that the bright blue Intelligent Access Management System is user-friendly and easy to use, a key feature at a volunteer firehouse venue which may have several different supervisors coming and going. 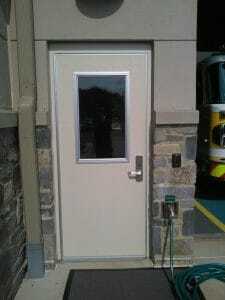 On that note, Strauss and Great Valley Lockshop installed Schlage aptiQ readers on 24 of the 26 doors. Door prop alarms were installed on all exterior doors, as well as the doors between the office and apparatus bay which use the lockdown function. PIN codes were added to the two readers, as insurance in the event of an accidental lockout. The remaining two doors were designed to leverage the bright blue Intelligent Access Management System for the door prop alarm. Great Valley Lockshop installed the system so that it is to be managed by a three-person team and support 150 users. “With the simple installation of a junction box and card reader at each door, I can easily customize 2 Cranberry Drive Parisippany, NJ 07054 Phone 973-316-3900 access requirements depending on location,” says Strauss. 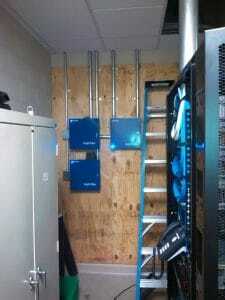 Most access management systems have six wires that require connection to the panel, but the bright blue system only requires two – a fact that made for a much smoother installation. What’s more is that Strauss was able to connect to the panel from his laptop to complete programming and testing before going live with the system. While Vanderbilt also offers technical support as part of its bright blue system, the solution is so easy to operate that even the volunteer firefighters can handle it. That’s a big advantage of the system, as most of the volunteer firefighters don’t have any type of technology background. This is also beneficial being that there’s a high turnover rate of volunteer firefighters, so less time has to be dedicated to training new firefighters on the system and users can be quickly added and deleted. Aside from simplicity and user-friendliness, however, the system was also reliable – something that could not always be said about the firehouse’s previous key scan system. “Bright blue always works the way it’s supposed to, which is absolutely critical in our line of work,” says Strauss. In an emergency situation, every single second counts. The bright blue system helps firefighters maximize efficient use of their time while in the firehouse so that they can more quickly mobilize to get out to an emergency. With help from the expert locksmiths at Great Valley Lockshop, Strauss and the East Whiteland Volunteer Fire Department are now able to worry less about access management and more about putting out fires and helping people in need. When push comes to shove, every second counts. Now in emergency situations, firefighters can simply do what they do best – put out fires.